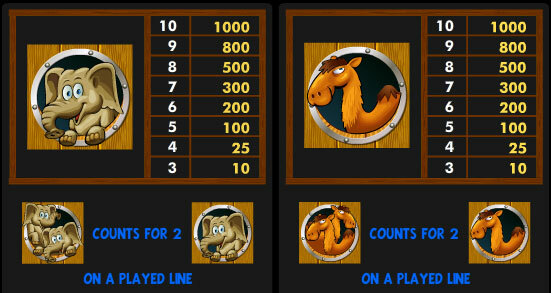 Noah's Ark Online Slots Pokies - Free Play Version is Here. Noah’s Ark is a fun filled video slot machine from IGT / Hi 5 Games and any player that enjoys animal themes will enjoy this game. Using 30 paylines and split symbols, players have the chance to make winning combinations of 10 symbols. There is a great free spin round that can offer huge payouts and the game can be played for free or for real money wagers but no Aussie players unfortunately at the moment for cash. With Noah’s Ark, players will embark in an exciting adventure and will enjoy the overall light theme, animations and bonus features of the game. Try Free Noah’s Ark slots below! When playing, the reels will be filled with various animals from the Ark and there are also special symbols in use. Lower paying combinations are created with standard paying card icons. The game uses great animations with winning combinations and there are special symbols that are used during the free spin round. All of the game icons are brightly coloured to present the best visual experience for punters. During the base game, the icons include a lion, hippo, elephant, camel and turtle. These are replaced in the free spin round, where the reels will then contain a giraffe, ram, zebra, ostrich and alligator. Seeing as this is a 30 payline slot machine, players can bet on one or all of the paylines and can control bets by choosing different numbers of paylines as well as the amount bet on each line. The game allows for line bets that range from $0.01 to $10 per payline with a max bet of 300 coins per spin. The top payout in the base game will award 10,000 coins, but he true rewards come from the free spin round, where the average RTP is 281%! depending on where you play though. To trigger the free spins, players will have to get five scatter dove symbols on the middle three reels. This will start players with five free spins. If they get six doves, this is increased to 10 free spans and there is the chance to retrigger the feature with additional scatter symbols. The free spins are played on a special set of reels with new symbols and these are also split symbols, so amazing payouts can be generated. The maximum amount that can be won with this feature is $250,000. Noah’s Ark is one of the better designed games from IGT and with stunning graphics and animations, the game is a joy to play. For those that are betting real money, the payouts are handsome and the free spin round will trigger often. This game does not come with a second screen bonus or even a gamble feature, but as long as players are successful in triggering the bonus round, they will be able to collect nice rewards from the bets that gave been placed. Google + Profile: Tina Lim on April 9, 2015. on January 26, 2018.